A wooden ellipse made of tempered glass, electrically welded by UV rays onto a steel plate; all of it is gently put on top of curved, varnished metallic legs, so to obtain a great aesthetic value. With Eliseo, a dining room was born, extremely refined, and available in the three-colors version, or with a double base. 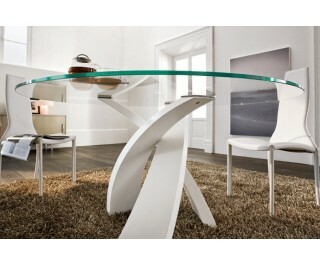 Table with shaped tempered glass and base in painted metal. Eliseo is perfect for those wishing their dining room to be unique with formal and exclusive Lines.